USS Concord AFS/TAFS-5 Members in good standing! These shipmates are Members of the USS Concord (AFS/TAFS-5) Veterans Association. They truly are "First Then" and they are certainly "First Now"! Thanks for your support. We'll add the names of all new members to this list. If you were listed here at one time and no longer see your name, please check membership status by clicking the link below "Tell me when my membership expires". 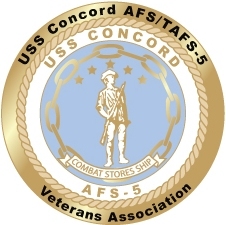 Click here to join USS Concord Veterans Association!